Vessel receiving electronics upgrades, photos unavailable until completion 6/15/18. In the 64’ Ocean Alexander you will notice the attention to detail from the moment you enter this vessel. She has a European transom with boarding gates on both sides. Her interior has a teak satin finish with burl tops on all flat surfaces. The entire boat has teak parquet floor with designer carpet overlay. The pilothouse, galley and dinette have teak and holly sole. The cockpit offers two-side boarding gates and line storage compartments on the aft port and the starboard side. A large hatch in the teak deck offers a very large full beam storage area that is separate from the engine room. There is an electric BBQ and stainless steel sink with hot & cold-water faucet located next to the engine room entrance. Stow away cockpit controls are located in the starboard deck house wing. From the aft deck you have access to the engine room by opening a hatch at the aft bulkhead. This offers you very easy access to the “stand-up” engine room. A stainless steel hinged door gives you access to the salon on the port side. When you enter the salon there is a large L-shaped sofa with storage and table to starboard .On the port side is a settee that converts to a double bed. Looking forward there is cabinetry with raised panel doors for storage, a large 40" flat screen TV, Bose audio visual and a wine cooler. Forward in the salon is an refrigerator with a larger countertop. Going three steps you enter the pilothouse that accommodates the dinette, U-shaped galley and the lower helm station. The galley is open to the salon with corian counter tops and four Sub-Zero refrigerator/freezer drawers. Going down the companionway, there are three staterooms with two full heads. At the entrance of the Master Stateroom is a washer/dryer. The master stateroom is full beam with en-suite head and separate shower, a large hanging closet and ample drawers for storage and opening port lights for ventilation. Sliding shoji screens dim the day light as needed with storage behind. On the starboard side is a built-in vanity with a swing out seat. There are also two nightstands with drawers. Going forward is a guest stateroom on the port side with twin berths and storage underneath each berth. There is also a hanging locker, shelf storage and two opening port lights. The VIP stateroom is located in the bow on centerline with large drawers under the berth and two hanging lockers, port lights and opening hatch. These two staterooms share a large head and shower on the starboard side. All heads have corian counter tops and both showers have corian trim and seats. The 64 offers full walk-around side decks with stainless steel railings. The foredeck has a large sun pad with a cover. Stainless steel boarding gates are located on each side of the pilothouse just aft of the sliding pilothouse doors. For convenience there are fuel fills on both sides The flybridge offers a sliding hatch that gives you access to the lower helm. 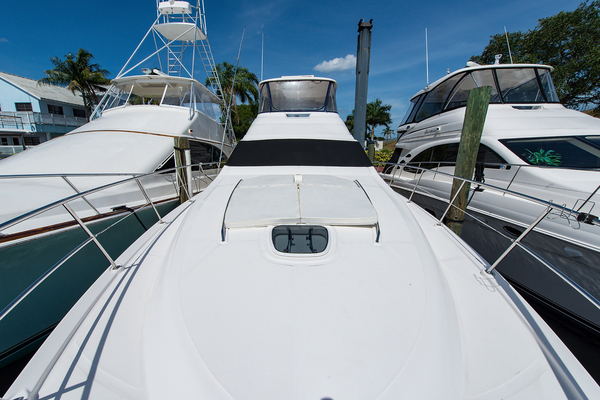 The second helm on the flybridge is fully equipped with all needed electronics. There is a flybridge sun pad and U-shape seating with a teak table and two helm chairs. A davit is located on the starboard side. There is a sink and refrigerator built-in next to the seating area. In addition there are custom Pipe Welders molded hardtop, dimmable lights and full enclosure. Aft on the flybridge there is a ladder down to the aft deck. Flat screen TV, Samsung 32"